One of the most annoying things when developing apps with OpenGL in Android 1.5, is the fact that there’s no access to the ModelView or the Projection matrices. It is not possible to call the glGetFloatv function because it wasn’t implemented until OpenGL ES 1.1, which isn’t available in the Cupcake versions. So, how to get the ModelView matrix on Android 1.5? 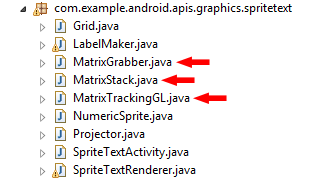 The first thing you are going to do is grab these three classes: MatrixGrabber, MatrixStack and MatrixTrackingGL. All of them are inside the API demos, under the package com.example.android.apis.graphics.spritetext. Finally, a post directly related to game programming! I will explain how to write a piece of code responsible for giving an extra life to the player’s character after a certain amount of points. The following code was written in Java, because it’s it would be shorter and easier to explain. Since this a generic algorithm, let’s assume that the game logic runs inside a method called Update() that is a member of the GameLogic class, responsible for our hypothetical game logic. Additionally, we need to have in mind that this method is being constantly called inside the game loop. This post will explain how to get posts at the WordPress loop, so you can place code (probably advertisement code) after a specific post (first, second, third) or at intervals (e.g. : every 3 posts). Before starting, it is a good idea to create a backup copy of your theme’s index.php file, just in case anything goes wrong. Let’s begin by finding where to place the code. That’s why we need to find the WordPress Loop in the index.php file.